Chicken Tetrazzini Casserole is such a classic and comforting casserole. This is creamy, cheesy and hidden with fresh mushrooms and peas. Topped with parmesan cheese and crispy breadcrumbs this is the perfect casserole! I seriously love a good casserole. They are so comforting in the cooler months and I especially love that they can feed my entire family. Chicken tetrazzini is such a classic. It is hearty and full of creamy pasta with the yummy addition of mushrooms and peas. 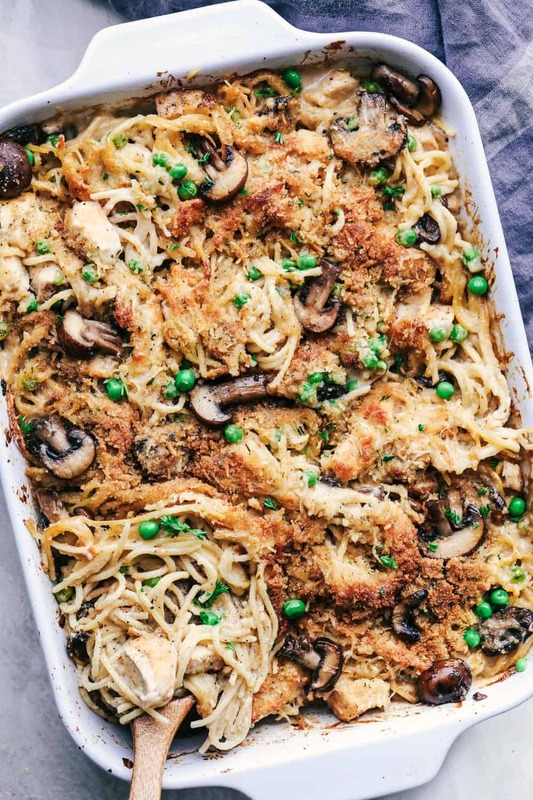 I have had some delicious chicken tetrazzini casseroles in my day, but I am here to tell you that this one is the BEST. A good casserole has to be creamy and cheesy and not dry at all. This casserole just happens to have a secret ingredient that provides such great chicken flavor to the dish. It is McCormick’s Simply Better Chicken Gravy. This gravy is not just for mashed potatoes. It is absolutely incredible used in recipe creations. It has real ingredients, like chicken stock, with vegetables, herbs and spices. This provided awesome flavor in this casserole and no additional seasonings were needed! I had some requirements when I created this casserole. It had to be creamy, cheesy, and topped with crispy bread crumbs and parmesan cheese. Oh my goodness. 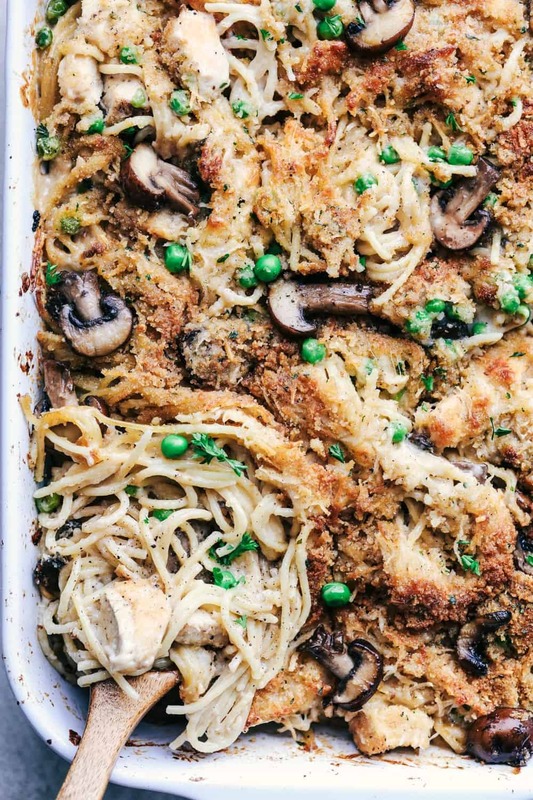 This casserole was absolute tetrazzini casserole perfection. So many amazing flavors and textures are happening in this dish. 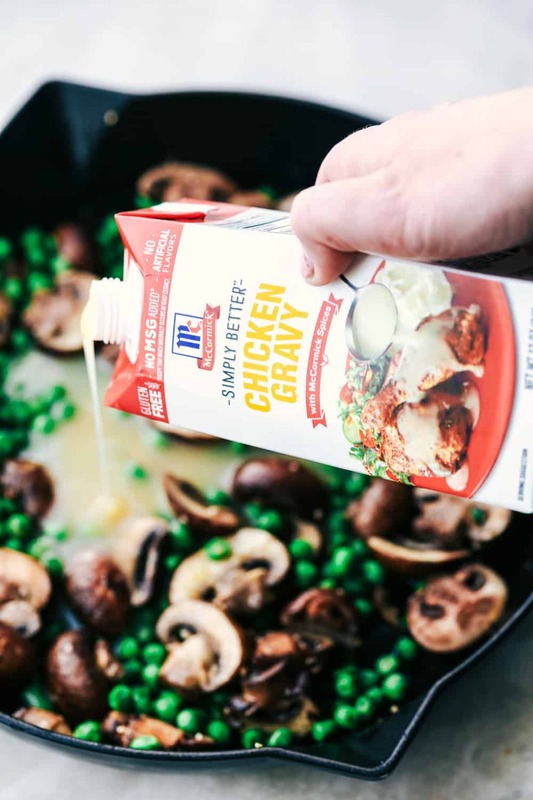 This is such a hearty casserole filled with chicken, mushrooms, peas, and pasta tossed in this creamy and delicious sauce. But topping it off with crispy buttery bread crumbs and parmesan cheese… WOW! This casserole gets a 10 out of 10 for our family! How do you make chicken tetrazzini? Begin by cooking your spaghetti pasta until al dente. Drain. In a medium saucepan add the olive oil, mushrooms, garlic, and peas and cook until tender. Add the flour, simply better chicken gravy, and half and half and let simmer until thickened. Add the spaghetti to a 9×13 inch pan and toss with the mushroom and pea mixture and cheese. Top with parmesan cheese, breadcrumbs, and butter. Bake at 350 for 30-40 minutes or until heated through. What is the origin of chicken tetrazzini? A common question asked is where does chicken tetrazzini come from? It is an American dish with diced poultry in a butter/cream sauce and parmesan sauce. This casserole will become a family favorite with the first bite. I can’t wait for you to try it! Preheat oven to 350 degrees. Spray a 9x13 inch casserole dish with cooking spray. Set aside. In a large pot cook the pasta according to directions and cook until al dente. Drain. In a medium sized saucepan add the olive oil, mushrooms, garlic, and peas. Cook until tender. Add the flour and cook for an additional minute. Add the simply better chicken gravy and half and half. Salt and pepper to taste. Let simmer until it starts to thicken. Add the sauce to the spaghetti and toss with chicken until coated. Spread in your 9x13 inch pan. Top with shredded parmesan cheese and bread crumbs. Drizzle melted butter on top. Bake for 30-40 minutes until heated through and the bread crumbs are brown on top. You forgot to mention that it is named in tribute to Luisa Tettrazini, the great coloratura soprano, a star of the Metropolitan Opera and contemporary of Caruso. Made this dish for dinner tonight and it was a huge hit. Will be making it again. 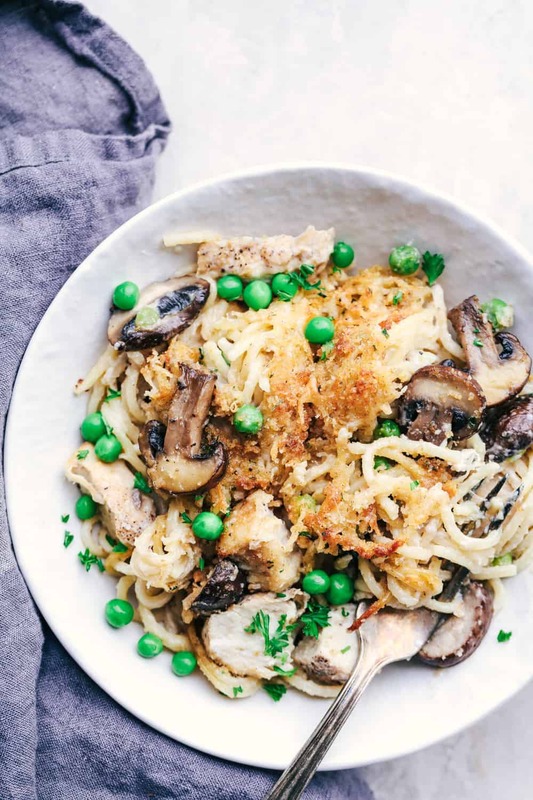 I’ve passed over tetrazzini recipes for years because all the ones I had ever seen seemed to be a version of pasta and cheese. Yours has the mushrooms, peas, and your “secret ingredient.” We loved it! Thanks! This looks really good. But if we can’t find McCormick’s Simply Better Chicken Gravy in our local store, what would be the best alternative? Thank you! I’m unable to find the Chicken Gravy. What could I substitute for it? Think this can be thrown tigether ahead of time?